The Zenobiaflex is a series of Japanese 6×6 TLR cameras made by the company Daiichi Kōgaku, later Zenobia Kōgaku, which also made the Zenobia folders. The distributor of the cameras made by Daiichi was Hattori Tokei-ten. All focus by moving the front plate. The original model (sometimes called "Zenobiaflex I") is advertised in March 1953 as a new camera, with no price indicated. The 75/3.5 lens is advertised as a new four-element Tessar type lens, and the shutter is a D.O.C.-Rapid with B, 1–500 speeds, advertised as "Compur type". In April 1953, the next month, it is again advertised as a new camera, but this time the shutter is called Daiichi-Rapid and the lens is called Neo-Hesper. This camera is still advertised in 1954, for ¥19,500. On this model, the film advance is controlled via a red window in the back, protected by a horizontally-sliding cover. The focusing knob is on the right hand side (when held by the photographer), together with the advance knob. The viewing hood has a sportsfinder built in, and a loupe that retracts behind the front part. The shutter is certainly the same model that is mounted on the Zenobia folders, but the shutter assembly is switched 90° to the left, to have the speed scale on the left and the aperture scale on the right (when viewed from the front). The DAIICHI-RAPID engraving is thus on the right side of the speed rim. The release lever is at the bottom, directly mounted on the shutter housing. There is a distant release connector at the bottom right corner of the front plate, while the synchro post, of the ASA bayonet type, is at the bottom left corner. The filters that can be mounted are of the screw or push on type. On the examples observed, the taking lens is engraved Daiichi Opt. Neo-Hesper 1:3.5/75mm. NO.XXXXXX and the viewing lens is engraved Daiichi Opt. View Hesper 1:3.5/75mm. NO.XXXXXX. The body serial number is engraved under the Zenobiaflex nameplate. On the advertising pictures, there is a DOC logo on the viewing hood, that is present on some actual examples but not all. One example has been observed with a red EP engraving in the strap attachment on the left hand side. The Zenobiaflex was sold with a rigid black lens cap covering both lenses, with a DOC logo on the upper part. Zenobiaflex, original model, EP engraving in the strap lugs. 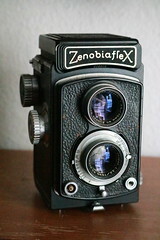 The Zenobiaflex II, presented in 1954 and advertised in 1955, has semi-automatic operation: the advance knob automatically stops and there is an exposure counter and double-exposure prevention, but the shutter winding is probably not coupled to the film advance. The lens is still a Neo-Hesper with f:3.5 aperture, but the focal length mentioned is now 77.5mm, while the viewing lens has f:3.2 aperture. The shutter is the same Daiichi-Rapid as mounted on the original model. The layout of the controls has slightly changed: the shutter speed and aperture are set by two levers, protruding from each side of the shutter housing, and the shutter release is now at the bottom left corner of the front plate (the new location of the synch post is unknown). The filter attachment is now of the bayonet type, and the loupe is mounted in a square frame and is bigger than on the previous model. It is not known if this model has an accessory shoe or not. Zenobiaflex F-II n°301202, Neo-Hesper 77.5mm f/3.5 taking lens n°702676, Hesper f/3.2 viewing lens n°702923, Zenobia-Rapid shutter. The Zenobiaflex F-II, advertised in 1956 and 1957 by Zenobia Kōgaku for ¥14,500, is very similar to the previous model except for the markings. There is also an accessory shoe and a film reminder in the advance knob, two features that were perhaps absent in the Zenobiaflex II. All the marking changes are related to the company's name change. The DOC logo has disappeared from the viewing hood and the shutter is now called Zenobia-Rapid: the name ZENOBIA–RAPID is inscibed above the lens and the company name ZENOBIA KOGAKU is written below. The taking lens in a Neo-Hesper 77.5/3.5, engraved Zenobia Opt. Neo-Hesper. It seems that the viewing lens is engraved View Hesper 1:3.2 with no mention of the focal length. The lens serial numbers certainly restarted at 700,000. The Zenobiaflex Automat, advertised in 1957 by Zenobia Kōgaku for ¥19,500, has automatic crank advance coupled with the shutter winding. The focusing knob is now on the left when held by the photographer, and the shutter speed and aperture are set by two small wheels and readable from the top, as on the Rolleiflex. The lens is the same Neo-Hesper 77.5/3.5 as on the previous models, and the shutter is a Zenobia MFX with B, 1–500 speeds. All the Zenobiaflex examples observed thus far were original models, the later ones seem to be much rarer, and some of them were possibly never sold. ↑ Advertisement for the Zenobia H-II, C-I, C-II, R and Zenobiaflex, published in the March 1953 issue of Asahi Camera, reproduced in Kokusan kamera no rekishi, item 573. ↑ Advertisement for the Zenobiaflex, published in the April 1953 issue of Asahi Camera, reproduced in Kokusan kamera no rekishi, item 576. ↑ Advertisement for the Zenobiaflex, Zenobia R I and R II and Zenobia C I, published in the April 1954 issue of Asahi Camera, reproduced in Kokusan kamera no rekishi, item 572. ↑ Example observed in an online auction and pictured in this page. ↑ Magazine articles mentioned by Kokusan kamera no rekishi. ↑ Advertisement for the Zenobiaflex II and Super Zenobia SR-1, published in the May 1955 issue of Camera Mainichi, reproduced in Kokusan kamera no rekishi, item 574 and item 577. ↑ This paragraph is based on the picture presented in the advertisement cited above. This picture is small and the details are hard to see. ↑ Advertisement for the Zenobiaflex F-II and Zenobia SR, published in the June 1956 issue of Sankei Camera, reproduced in Kokusan kamera no rekishi, item 1324 and item 1325. ↑ Advertisements mentioned by Kokusan kamera no rekishi. ↑ Advertisement for the Zenobia 35 and Zenobiaflex Automat, published in the September 1957 issue of Sankei Camera, reproduced in Kokusan kamera no rekishi, item 1326 and item 1327. Asahi Camera (アサヒカメラ) editorial staff. Shōwa 10–40nen kōkoku ni miru kokusan kamera no rekishi (昭和10–40年広告にみる国産カメラの歴史, Japanese camera history as seen in advertisements, 1935–1965). Tokyo: Asahi Shinbunsha, 1994. ISBN 4-02-330312-7. Items 572, 576–7, 1325–6. Cameras whose actual existence is dubious are in a lighter shade. Cameras in yellow are variants sold and maybe assembled by other companies. This page was last edited on 5 February 2019, at 21:03.